For the serious competitor only, TURBONETICS offers custom-matched and custom-built turbochargers designed to get you across the finish line first! Designated the T-Series, this turbo family incorporates the latest “state-of-the-art” turbocharger aerodynamics and the toughest durability available to the maximum performance engine builder. With a wide range of flow capacities (T58, T61, T64, T66, T70, T72 and T76) capable of supporting 550 to 950 HP with a single turbo. 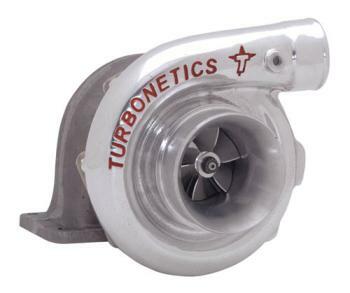 All T-Series turbos are custom built to your specific application and include the TURBONETICS Big Shaft components. Dynamic seal is standard, but new carbon seal configurations are now available (see below). Your choice of O or P trim turbine: .58, .69, .70, .81 or .96 AR “on-center” and a full range of tangential style turbine housings are optional. Q trim and the patented TURBONETICS’ Ceramic Ball-Bearing option are also available. All Standard and “Big Shaft” Ceramic Ball-Bearing turbochargers are now available with Carbon Seals! Expressly intended for draw-through (i.e. : carbureted) applications, TURBONETICS now has the capability of producing carbon-sealed versions of all of our Ceramic Ball-Bearing turbochargers. Turbo selection is no longer limited to early T04B and Rajay configurations. Now you can step up to the turbo that’s right for your application without compromise!